In continuing with the #CleanItForward Campaign by Finish Power & Free Alliance of Moms (which is a network that explores a new product line, Finish Power & Free, featuring less harsh chemical formulas, without sacrificing the power of Finish results – a win for even the tiniest members of your family! ), today I want to talk food. I love food. I love food more when it is healthy and/or promotes a healthy lifestyle for my two main squeezes. My personal view of snacking and food in general is this: I want to serve my family meals and snacks that are not only tasty, but a good source of nutrients and essentially sustainable. I want to keep these people in my life for as long as possible and all that's in my control is the food consumed. That being said, we snack healthily. I have a lot of healthy (and some not-so-healthy, but it's OK to indulge sometimes) recipes on my Recipes page if you want to meander over there for a peek. 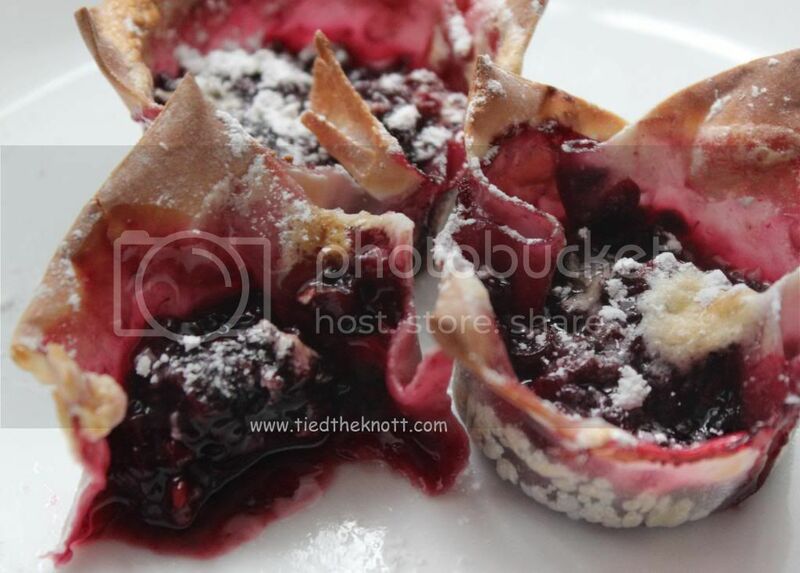 Some favorites include: Green Chili Chicken, Granola Bar Muffins, Stuffed Peppers, PB-B Bites, and a recipe I will share below: Wonton Dessert Cups. AMAZING and less than 150 calories for the whole recipe which makes FOUR dessert cups (I usually say two per person so boom. Dessert is 75 calories.)! They are delicious. That'll be below but first, I want to talk about healthy snacking. I have been able to lose 50 lbs over the last few months (since November 4th, 2013 to be exact) and while it's been a challenge because it was mostly running and I used to HATE running (now I crave it), I attribute a lot of my success to the choices I've made in the food department. Specifically my diet. Tyler and I have never been the kind of people who strictly buy organic or locally grown items. Not that there's a problem with that, it's just not how we were raised thus not the path we are familiar with. I shop with coupons, plain and simple. 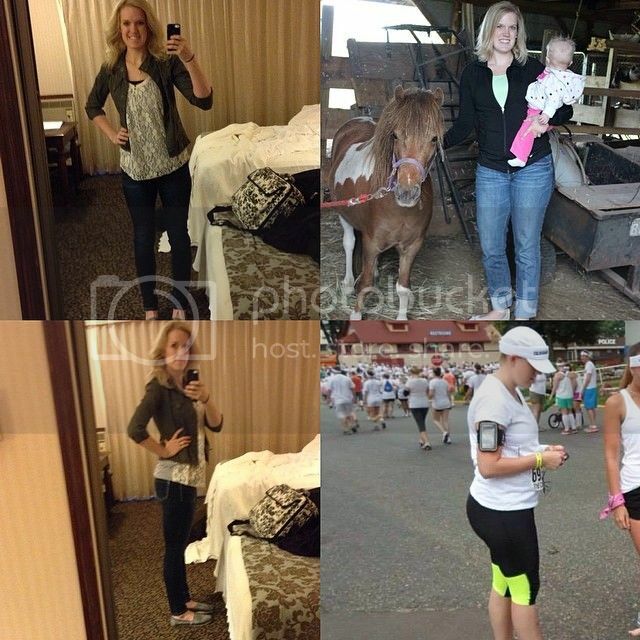 Just to prove it, here is my before and after which was when I was down about 45lbs. Some of you have seen it already but that is A-OK! I'm showing it again anyway. Portion. Control. Works. I refused to sacrifice any foods I liked being that I wanted a diet modification that was sustainable. Cutting out carbs? That would work for me for about a week. I love breads and pastas and I would absolutely gain all my lost weight and then some back in about 2.5 seconds if I decided to go that route. Not a productive diet for my lifestyle so instead I really began to focus on portion control. Now portion control is intimidating and a lot of people say they don't have the time to portion things out because quite frankly, it's just easier to eat snacks right from their original bag, but today I will share with you the EASIEST way to use portion control. Step one: buy snack-sized bags or sandwich bags. 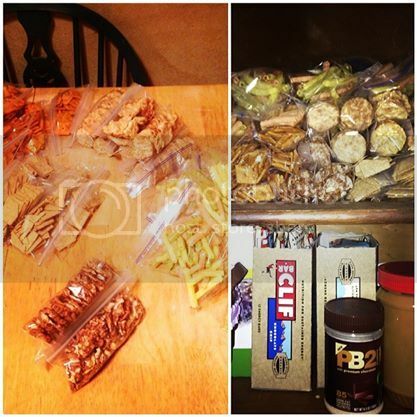 Step 3: take ten to twenty minutes one night a month and portion out a couple dozen snack bags. Now we take these snack bags everywhere. 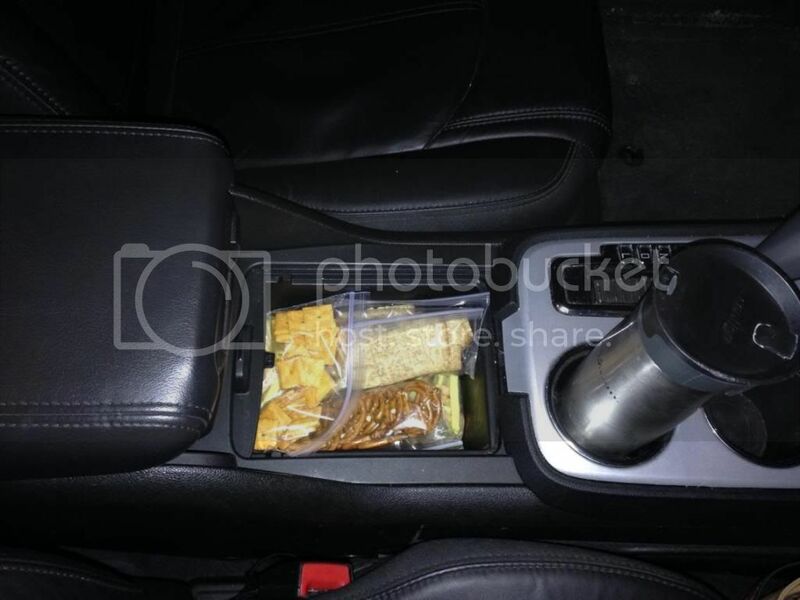 They're great for the snack cupboard, the diaper bag, and I even keep some in the center council of my car! Whenever Kylie asks for a "nack", I have one handy which eliminates a panicky, unhealthy, hasty purchase, saves a few dollars, and ensures Kylie never starves (never a risk anyway, but I fancy the dramatic). I do the same thing with meats. Cook a lot in advance, store in freezer bags in their appropriate portions, and freeze so you can have a quick, easy supper! 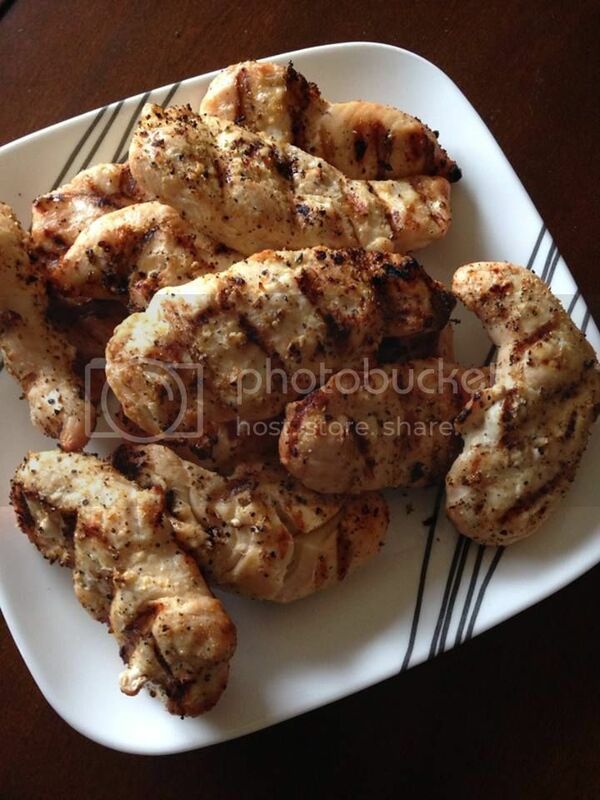 (Great when cooked/grilled with a low/no sodium sprinkle like this Mrs.Dash Lemon Pepper.) By preparing the meat this way, you can cook (re-heat) the whole bag and eat the whole bag with absolutely no guilt because you know what's in it. Easy. Peasy. Finally, we do the same thing with our produce purchases. If the fruit and veggies are clean and readily portioned, they are much more likely to get selected than if they weren't cleaned and grab-able. Welcome to the almost-always-stuffed Knott fridge where we have fruit and veggie bowls at the ready. And we always have hard-boiled eggs peeled and in the fridge too. Kylie loves them and they are a GREAT source of protein. Not to mention an egg white is only 17 calories. WHAT?! Yes. 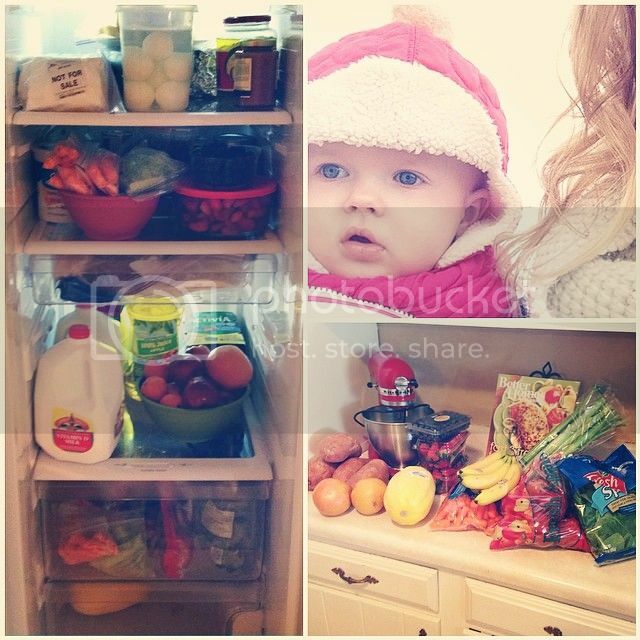 What do you and your family do to promote HEALTHY SNACKING in your home? I'm always looking for new and effective ways to keep the healthy snacks flowing! Continuing on with my food rant, because I love food, Tyler and I love dessert. OK in the interest of full disclosure I love dessert, which forces my husband to tolerate it after almost every supper. I know... it's a big sacrifice he has to make for love. ;) In fact, I think I love eating dessert more that I love eating real food! My waistline doesn't share the affection. Kidding because these don't change your waistline. Indulge without OVERindulging. Check out this crazy concoction I like to call Berry Cups. 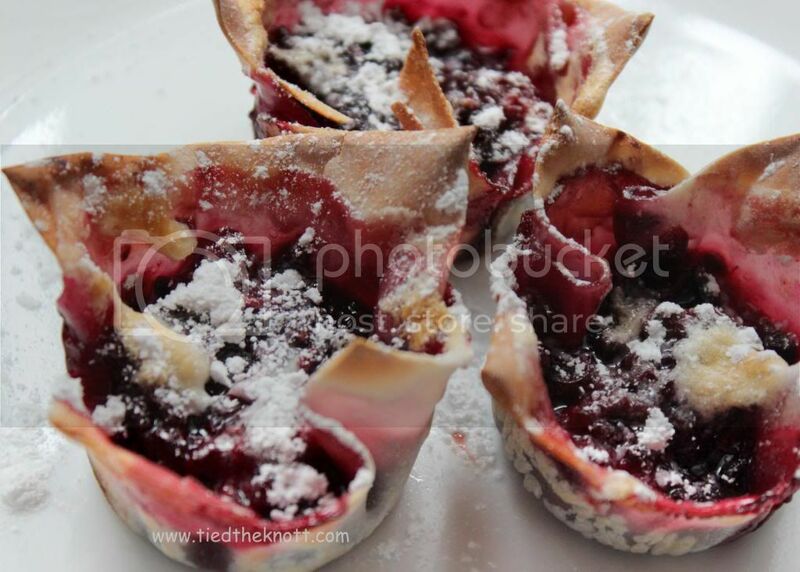 Or Wonton Dessert Cups. 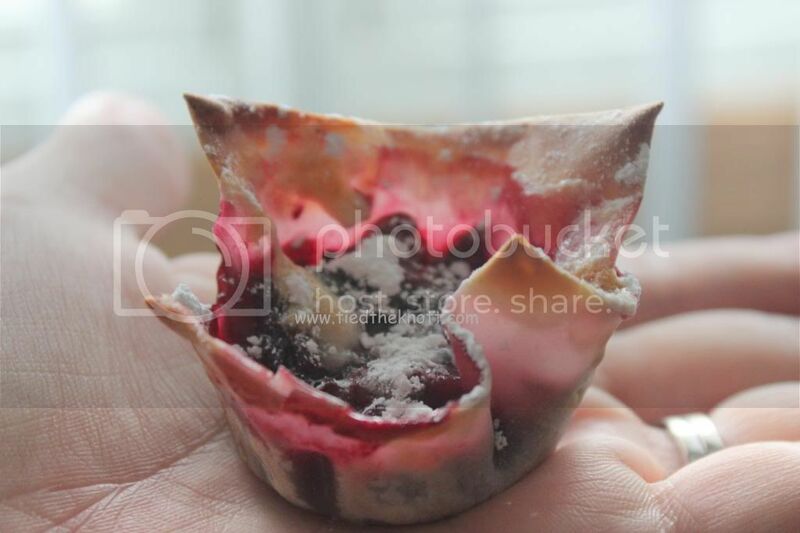 Or Dessert Cups. Name them what you want just make them and indulge (you can use almost any berry... but I stick to blackberry, raspberry, or blueberry). Half each of the marshmallows with scissors. Mash blackberries (I tossed them in a baggie and smooshed them up, cut the bottom corner of the bag, and piped them in... use the easiest method for you!!) and spoon into the bottom of the wrapper. Sprinkle with marshmallows. Bake for 10 minutes or until marshmallows are almost gone/browned and tips of wrapper are golden brown. If your cups are a little tart, don't hesitate to add a sprinkle of powdered sugar (1 tsp = 10 calories). So good and not so bad. Now I have other means of keeping my family as healthy as possible as well again, doing everything (in my control) to increase their longevity. Another thing I have done, and I've mentioned this before, is I have switched to Finish® Quantum. It has been months now since I've switched to Finish® Quantum and it was such a SIMPLE transition. In fact I rarely think about it anymore as all I do is grab a tablet and toss it into the dishwasher! That easily I can control (and limit) the harsh chemicals I am using to keep my dishes AND Kylie's NUKs and sippy cups clean. That's right - Finish® Quantum is mild enough to use on NUKs and bottles!!! I like to say that I try to keep my kitchen a germ-free zone and Finish® Quantum has been an integral part in that. 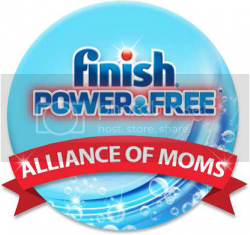 You can help put Finish Power & Free to the #FinishMoms test! Share the news of a "less harsh chemical formulas" dishwashing product and help us #CleanItForward!! Learn more about the Finish brand from my previous Alliance of Moms post!! disclosure: i received product and payment in exchange for my open and honest opinions/review of Finish Quantum products. These opinions were not swayed in any way, but simply reflect my experience with the product. Like most things in life, I have learned a lot of things the hard way. Today, I want to share some tips that have changed my whole running experience and some things that turned my bad experiences running good again! First thing first: SOCKS! I had no idea that the socks mattered as much as they do. In January, I wanted to start the year off with a bang by running a lot. I mean, I had 1,000 miles to go, so I thought I'd get a jump on things. Little did I know, I would have to take a couple days off because I had blisters on every. Single. Toe. My feet took such a beating and I couldn't figure out why until some friends suggested I get better socks and what a world of difference they have made!! 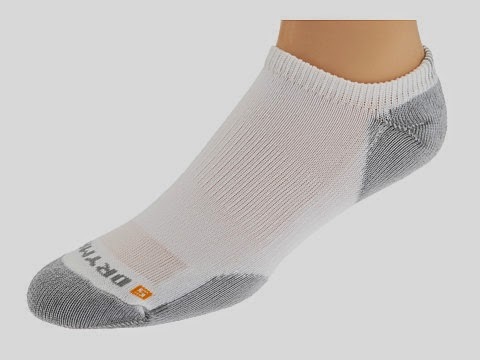 I bought 6 pairs of these (different fits available) and they are amazing. STRETCH! Just a short time ago, I experienced bursitis which is inflammation in the bursa sacks in your hip joints. Your IT band begins to fray and constant rubbing of that frayed muscle on the joint causes this inflammation. I am not a health expert. I'm in marketing. This is just my understanding of it after speaking with my healthcare professional. MY professional opinion on the topic is this: HURTS LIKE HECK! 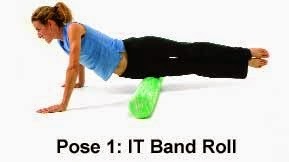 The best way to stretch the IT band (again, something I learned from my HC person, check with yours to see if they agree) is to get a foam roller (sold at Target among other places). Between that and icing, I was able to alleviate most (and now all) of the pain. Rest is always beneficial too which I learned the hard way. Create a good play list! At the Half Marathon a couple weeks ago, I decided to listen to Imagine Dragons and it was an AWESOME Pandora station. That's my recommendation. It totally got me pumped for almost two hours of running. The last thing that's worked for me is my Garmin watch. My husband bought it for me a few weeks ago and I LOVE it!!! 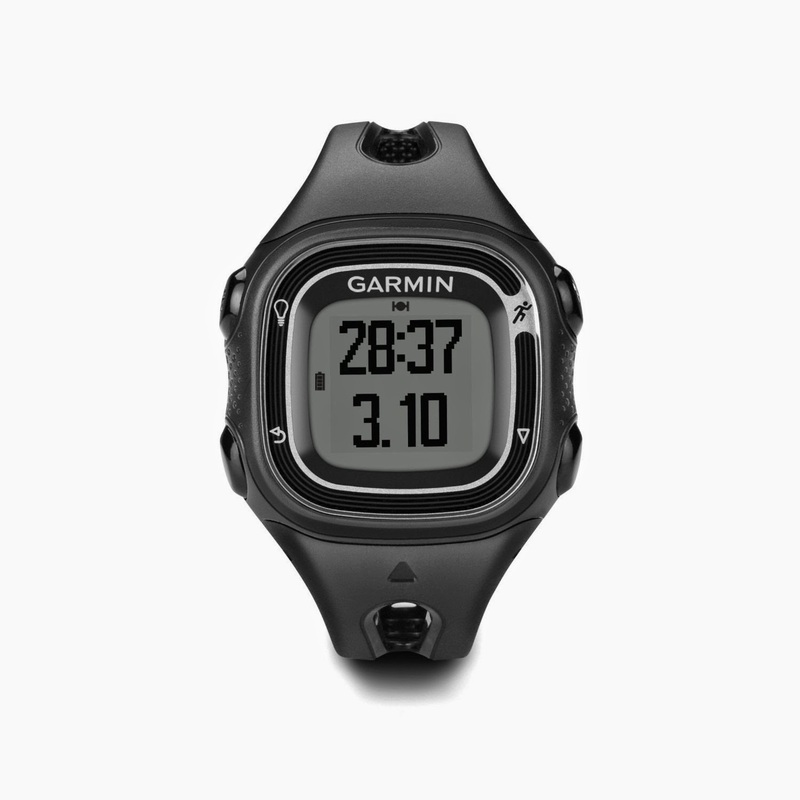 I got the Garmin Forerunner10 and it is the greatest thing ever. My only complaint is that it sometimes takes a while to find my location. Otherwise it's awesome. You can set your pace which allows it to alert you when you are on, ahead of, or behind pace by beeping. It also tells you your distance, calories burned, running time, and how long it took you to complete each mile with an overall average pace. You can then go online and look at a map of your run which also goes through the weather conditions, a line graph of your pace, and a number of other things. Seriously, I can't say enough great things. I love it. Here. This is also where I got the watch! There you have it. MY recommendations for making running fun (and bearable) :). This is the most SIMPLE and beautiful meal that you can make. Not to mention it is DEEE-LICIOUS. 1 can pineapple chunks/pieces in 100% juice. Keep the juice from the can. You can also add peppers and whatever else you'd like. ALSO, this is a great freezer meal. Meaning you can throw ALL the ingredients in a gallon-sized bag and freeze it until you're ready to cook it!! 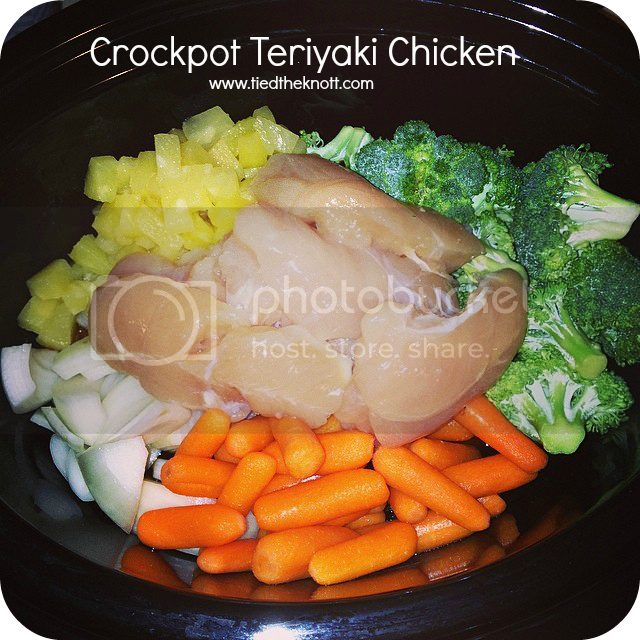 Throw all ingredients (with juice from pineapple) into the crockpot and turn the temp to high for four hours until the chicken is cooked through. Serve over freshly cooked brown rice.